The league will run three months with a separate competition held each month. Courses and games should be scored according to any rules basis stipulated by the designer of the game. Any game can be used so long as placements are clearly defined and the game can be played by all participants in a timely fashion. Team scores are determined by the top five scores of all dogs competing within a single club or franchise. Results for each month must be sent to the League Secretary (Bud Houston; Houston.Bud@gmail.com) by midnight on the final day of each month. Scores that aren’t submitted in a timely manner will be eligible for Lifetime Performance Points for all participating players but will constitute a forfeit in league competition. The League Secretary shall be responsible for posting results for each participating club or franchise within three days of receipt of those scores. The League Secretary shall be responsible for posting aggregate competition placements within three days of the end of each month. Team results will be tracked by the League Secretary and reported back to the league membership at the termination of the league schedule. The League Secretary shall be responsible for maintaining a roster of teams, posting results of league competitions and accumulated scores in a timely fashion. The League Secretary shall be eligible to participate in competition with one or more dogs. The League Secretary shall be responsible for choosing a game master / course designer for each monthly competition. The only true cost associated with participating in the National Dog Agility League is in recording fees. This is paid at a rate of $1 / dog / run. A club or franchise shall pay the nominal recording fee at the time results are submitted. This payment must be received at the same time as results; else, results will not be recorded or posted. Questions comments & impassioned speeches to Bud Houston Houston.Bud@gmail.com. Visit the web store: www.dogagility.org/newstore. You’ll find The Book of Agility Games, an invaluable reference to clubs engaged in league play. This is an open invitation to join our league. While it’s late to actually compete in the inaugural league, the final course of that league (July) would be a good way to introduce in your agility center, and be ready to roll with the Summer League (rules and stipulations to be released by the end of July). I’m having a great time with play in the National Dog Agility League (NDAL). Our first official season is clearly being dominated by Team Canada. But don’t you know, somebody’s got to win, and they play a pretty rough and rugged game up there. 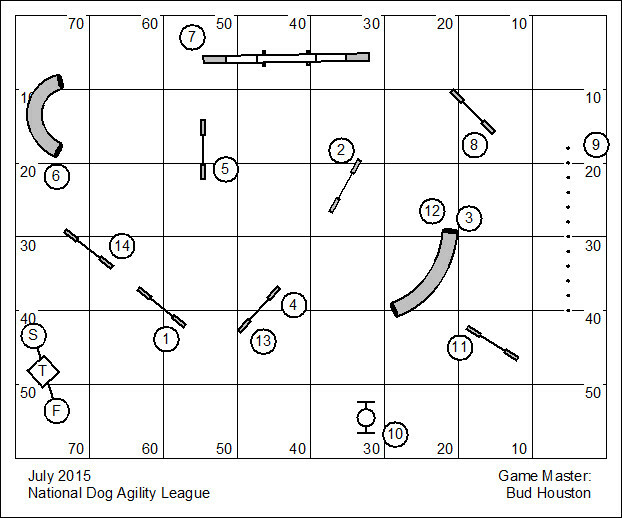 One of the real differences between play in the National Dog Agility League and any of the agility organizations that demand mastery of the sport (USDAA, AKC, FCI) is that every single error doesn’t have fatal consequence. Think about it, in AKC Excellent if the dog makes any error the dog and handler are eliminated and dismissed ignominiously. It’s not enough to deny the Q. The score is scratched as though it never even existed. In the NDAL we’ve adopted a system that provides a granularity of scoring so that a performance can be measured against the field of players. For example, a dog might miss a contact. Under our rules he has earned 5 faults. And this might very well place that dog in the upper 7% of dogs who competed. And so the performance is honored and celebrated, rather than dismissed. We’re looking to grow the National Dog Agility League. The long-term view is that we’ll have a national championship tournament that features the top 64 teams (kind of like the NCAA basketball tournament). Well, we won’t have to worry about that for awhile as we are a long way from having a field of 64 teams. Right now we’ll content ourselves with being small, but happy. The only source of income is in recording fees which is, precisely, $1 per run. I’m happy to say that we have enough of a small income that I can apply those funds to a small Clean Run ad each month. Perhaps we’ll be able to attract a few new clubs and continue to grow. The spring league certainly has had a strong international flavor. That means that each course was a tough riddle featuring challenges that would daunt the timid. Below I will share each of those courses with you. I really love the problem solving that goes into these course. I suppose I love USDAA Masters Challenge courses for the same reason, though I’ve learned (the hard way) that the traditional “8 minute walk-through” really isn’t enough time to solve. I like the idea of publishing a course well in advance so that the competitor can pour over the course map and develop a plan that has the highest probability of success. Steve Schwarz asked me for a critique of his design effort kind of early on. But I declined to do so. I don’t really want to constrain or even influence the approach we take to course design in the NDAL. It is what it is. The course is a bit bottom heavy. You’ll note that 2/3ds of the obstacle performances are on the lower1/3d of the field. The transitions between some of the obstacles are very short. When combined with the technical challenges of the course, there’s not a lot of opportunity for a dog to be working in full extension. “Warning flags” aside, the course turned out to be a fine romp. The course probably favors quick little dogs with tight turning skills. You can still run this course and add your dog’s scores to the historical record of the course, though it’s now too late to submit league scores for the course. Download the May 2015 scorekeeping worksheet. I will review the June NDAL courses tomorrow. This is a bit of a late posting. I’ve had a very busy start to the month of July. And it has put me behind. The course shown below was emailed with the scorekeeping workbook to all current NDAL clubs at the end of June. New players are always welcome! July’s course is the final course of our inaugural league. Within the week the Secretary will send to all of our current member clubs the proposed League Rules for our Summer League. Everyone will have about a week to comment (and perhaps influence the consistency of the league). Mostly our reporting has been slow and late because some league players have been slow and late. We propose in the Summer League Rules a firm cutoff date and time for reporting results. All results submitted, will accrue Lifetime Performance Points (LPP) for everyone who runs the course. But late results will not be scored in the league competition.